Although a number of different types of woodworking glues are now supplied in liquid form, the term "liquid glue" is generally limited to certain glues of animal or sometimes plant origin that are supplied in liquid form ready to use. In the past, such liquid glues-were usually manufactured from the skins, heads, and swimming bladders.of fish. More recently, other liquid glues have been developed,'based on animal glues derived from hides, skins, and bones of cattle. Liquid glues are also prepared from starch, natural gums, casein, and certain thermoplastic synthetic resins. At the Forest Products Laboratory tests have been made on a number of glues of animal or fish origin. Af earlier series of tests indicated that differentglues varied widely in their resultant joint strength. Some were so weak as to be entirely unsuitable for woodworking purposes, and others compared favorably in strength with conventional animal glue ("hot" glue or "hide" glue). More recent tests on samples of liquid animal glues indicated more consistent performance, although some glues gave more uniformly good results than others when bonding was conducted under a series of different temperature and assembly conditions. The better glues were again comparable with "hot" glue. In subsequent tests, however, after 6 months' storage at 80* F., these same liquid glues produced joint strength values of only 45 to 65 percent of their strength when used fresh. No significant physical changes in the glue samples were observed during this storage period. These results indicate that samples of liquid glues should be usedas soon as possible after receipt. Liquid glues may be tested by gluing together pairs of carefully selected hard maple blocks and testing the joints in a testing machine to determine the force required to shear them apart. (See American Society for Testing Materials Method D905-49. ) In such tests at the Laboratory, the better liquid glues showed values for average shearing strength from 1. 600 to 3, 800 pounds per square irkh- of- -glue joint, depending on the gluing conditions used. In addition to uniformly high adhesive strength and convenience of use as received, certain other characteristics are desired in a liquid glue. When spread upon wood surfaces, it should "set" or dry rapidly. In its container it should remain fluid and workable at all ordinary temperatures. It should not be unusually susceptible to the', action of high temperatures, high humidity, molds, and bacteria. Liquidglues less sensitive to temperature effects during gluing than typical "hot" glues would be -desirable, but such versatility of these glues has not yet been adequately established. 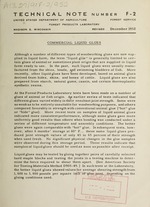 The Laboratory tests gave evidence that the strength of a liquid glue, like that of "hot" glue, depends largely upon its "body" or thickne s s, or strictly speaking, upon its viscosity. Generally the thickest or most viscous glues showed the greatest adhesive strength.